The iPad mini first graced shelves in 2012 and its design hasn't changed much over the last seven years. The internals are a different story though, and Apple has upgraded it several times - this 2019 model being the fifth generation of the popular compact tablet. It's certainly true that the iPad mini holds a special place in many hearts due to its convenient size. An update has been long-awaited by many users who like its compact size, often because it'll easily fit inside a bag or large pocket. But the landscape for mobile devices has significantly changed since the iPad mini 4 in 2015. Then, a 7.9-inch device was still far more sizeable than many smartphones. But with the move towards big screen phones of the last few years - not least Apple's own ginormous 6.5-inch iPhone XS Max - the line between tablets and phones is becoming ever more blurred and is set to become even more so as foldable devices debut and grow. So can the new iPad mini hold its own in 2019? The 2019 mini retains the fourth-generation device's most recognisable features: the 7.9-inch screen size alongside Touch ID. The screen real-estate is nearly twice that of the iPhone XS Max and the tablet's 4:3 aspect ratio does make it better for viewing and editing documents, making notes and looking at pictures compared to a smartphone screen. The overall aesthetics haven't changed and although the aluminium body still looks the part, the bezels around the screen remain huge. It's not just that we've been spoiled by the iPad Pro, even many laptops have far more aesthetically-pleasing borders nowadays. The lack of competition probably doesn't help - while Samsung and Huawei try, no manufacturer is really pushing Apple in the tablet market, certainly not around this size. The new mini is slightly heavier than the older model by around 10g. However, the dimensions remain the same, so older accessories like smart covers will fit, as will third-party accessories. Again, it's available in Silver, Space Grey and Gold, although Apple's definition of 'gold' has shifted slightly since the last iPad mini - it's now more of a rose gold even though it's not billed as such. It's clear that Apple is choosing to differentiate between the 'standard' iPads and the iPad Pro lineup. The headphone jack stays on both the iPad mini and the new iPad Air, whereas it has been binned for the iPad Pro series. Touch ID and the home button remain instead of Face ID too. And there's Lightning and stereo speakers here, whereas iPad Pro is all USB-C with quad speakers. There's clearly no desire to roll out USB-C across the range of iOS devices for now - Apple probably reasons that USB-C's high data throughput and 4K display support just isn't needed on non-Pro iPads. The other key feature for this new mini is Apple Pencil support for the first time. It's the same as 2018's 9.7-inch iPad in that it supports the older Apple Pencil rather than the newer magnetic type that works with the iPad Pro. The Pencil experience is excellent for making notes and marking up documents - signing PDF forms is a doddle and you quickly get used to the sensitivity and what you can do with it in, say, Notes where it's great for just noting down ideas. Moleskine is launching a new app in late March 2019 called Flow that's essentially a continuous notebook for drawing, sketching and writing down ideas. Apple has also showed off the upcoming Pixelmator Photo auto-enhancement app designed for use with Apple Pencil, while iWork suite (which is pre-installed and included Keynote, Pages, Numbers, Garage Band and iMovie) will work even better with Apple Pencil, too, including new path effects in Keynote and annotations in Pages. But how many iPad users will actually spend the extra to buy the pencil is debatable. It's also a shame that it can't attach to the iPad in any way - although various accessories will surely be available to carry around both together. It's been four years since the last iPad mini hit the streets and so the 2019 model is a serious upgrade internally. Gone is the 16GB entry-level model - 64GB is the new minimum, joined by a 256GB version. The Apple A8 platform has been replaced by the A12 Bionic from the iPhone XS, XR and XS Max alongside the M12 co-processor. This all shows in basic use, with everything being extremely snappy. Apps install and run quickly and we experienced no performance las. You will be able to run pretty much everything the App Store can throw at it, including full support for ARKit apps as well as the latest games. To get a sense of where the iPad mini sits in terms of performance, we ran some tests. For multi-core performance, it's more powerful than every iPad ever, save the latest generation of iPad Pros. Yes, it's even more powerful than the second-generation iPad Pro released in 2017 or the iPhone X. Impressive stuff. Cited battery life is around 10 hours of constant use, but as with other iPads you really have to use it constantly to notice serious battery drain. After around 48 hours of on-and-off use our iPad mini was still at around 70 per cent. We mentioned the display previously - it's the same size and resolution as before, but it's now a TrueTone display with support for wide colour and 500 nits brightness. TrueTone essentially corrects the white balance and display brightness depending on your environment. It is a super little display. Other specs have naturally also been upgraded across the board - there's now the latest Bluetooth 5.0 on board in addition to faster 4G. And on the cellular models, there remains a nanoSIM slot, but you can use eSIM. Note that while iPad mini can use Apple Pay for online payments, it doesn't have NFC so you wouldn't be able to use it to pay in a shop. Which is probably for the best. The cameras have also had a bit of an upgrade - there's still an 8MP rear camera with 1080p video that can now capture HDR photos (that's High Dynamic Range, to balance out shadow and highlight exposure for a clearer shot). It'll be fine to use in an emergency, but the camera on your smartphone is almost certainly better. The front camera has had a more serious upgrade. It's now 7MP with 1080p video - it was a meagre 1.6MP previously. The images we took were perfectly decent - gone are the days when iPad photos had a certain blur to them - not that we'll be using it as our primary camera in any case. Software-wise, the iPad mini ships with iOS 12 - 12.2 to be precise - but it will no doubt be able to be updated to the upcoming iOS 13 software later in the year. Overall pricing has reduced for the equivalent models in terms of storage size - the starting price is still the same as it was for the old iPad mini in the US, at $399/£399, but you get 64GB of storage now instead of 16GB. However, it must be said that the iPad mini is $70/£60 more than the larger 9.7-inch iPad, which starts at $329/£319. Our review model is the 256GB version, which you may find you need if you're a total app addict or you want to store a whole bunch of videos for that upcoming flight. We think 64GB is capacious enough though, especially for cloud users, so will be more than enough for most needs. Our favoured combo of price and capability is probably the 64GB cellular version - you'll pay $529/£519 for that option. You can get some great deals on an iPad data SIM-only package now and if you can run to it, it certainly makes the iPad a whole lot more useful when you're out and about. Another option is to get the Wi-Fi version and tether from your phone - networks are a little more generous with tethering allowances nowadays, but it can be a killer for your phone's battery life. The iPad mini is a huge leap in terms of performance over its predecessor and last year's 9.7-inch iPad, too. If you want a more compact iPad, there's little we can say against it. Yes, there is some sadness that iPad mini couldn't have had smaller bezels and been a little more progressive in its appearance, but we don't believe that many would-be buyers will be put off by that. The 2019 mini is remarkably powerful device, especially when you team it with Apple Pencil and a third-party Bluetooth keyboard (Apple doesn't make an official one, though, as iPad mini doesn't have the smart connector found on the new 10.5-inch iPad Air and the iPad Pro lineup). There's simply no better tablet at this size, with ultimate portability and unparalleled power for its price point. It's cheaper, it's bigger. 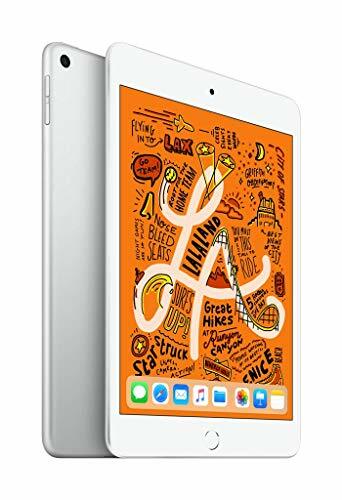 Chances are you'll have considered the standard 2018 iPad already and for most people, it will still be their first choice largely because of the excellent price point. It isn't anywhere nearly as powerful as the new mini, however. In our review of the M5 last year we said it was genuine competition for the iPad mini and we haven't changed our minds since. Because of the lower price point and slightly bigger display, it's a serious option if you're not determined to have an iPad and iOS.